1. Fetal bovine serum is of the highest quality (mycoplasma, virus, bacteriophage, and endotoxin tested). Store serum at -20°C before heat treatment and at 4°C after heat treatment unless it will be stored for a long period, and in that case, store it at -20°C. We have used Hyclone and GIBCO brands of FBS. 2. S2 cells can also be cultured in commercially available Schneider's Drosophila medium (GIBCO) supplemented with 10% FBS, or adapted to CCM3, a synthetic medium supplied by Hyclone. Fig. 3. Spindle assembly in cells depleted of Cnn by RNAi. S2 cells treated with control dsRNA (A and C) and cnn dsRNA (B and D) were fixed and stained for microtubules (anti-a-tubulin) (A and B) and Cnn (C and D). 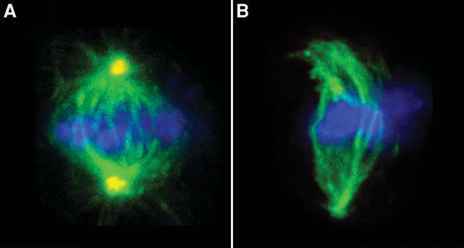 The cells were also stained for DNA, and the merged three-color images are shown in Fig 4. Note that in the cell depleted of Cnn by RNAi, there is no signal for Cnn detected at the spindle poles, which are consequently deficient in astral microtubules. 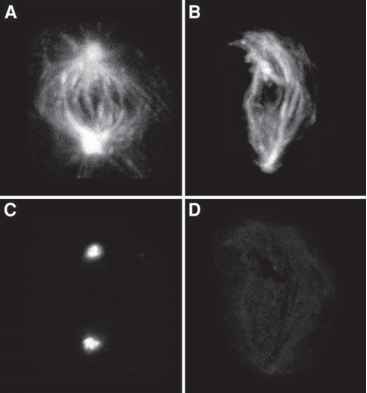 Cells at different stages of the cell cycle are deficient in astral microtubules in Cnn RNAi cells (not shown). In these cells, the mitotic spindle is assembled via an alternate pathway that does not utilize centro-somes (34). The images shown were captured on a Leica TCS SP confocal microscope equipped with argon, krypton and He-Ne Red lasers. The images were collected as a Z-series about 6 |im thick, and the maximum projection through the stack is shown. 3. A variety of fluorophore conjugates are available commercially. Molecular Probes sells a set of secondary antibodies conjugated to a variety of "Alexa" fluorophores, which are more resistant to bleaching. 4. For PCR, substitute any thermostable DNA polymerase and reaction conditions with which you are familiar. We have found that the Clontech Advantage2 PCR enzyme/buffer mixture gives a high yield of product. 5. If the PCR produces multiple bands, the reaction conditions need to be optimized. See ref. 41, or the Promega Protocols and Applications Guide (free from Promega) for guidelines. If the yield is low, multiple reactions can be combined. 6. As an alternative, satisfactory results were obtained from PCR templates that were cleaned up by phenol/CHCl3 and CHCl3 extraction followed by ethanol precipitation and a wash with ice-cold 70% ethanol. 7. The methods for the preparation of culture media and the culture of Drosophila cells were all from ref. 42. 8. It is necessary to always include a control dsRNA in these experiments. Use something that should have no effect (like lacZ, green fluorescent protein [GFP], or bacterial plasmid vector sequences). 9. 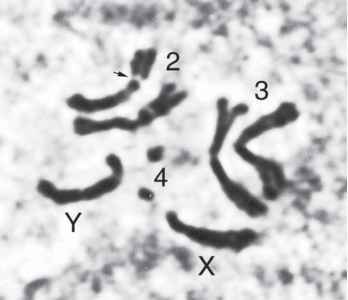 For a dsRNA of approx 700 bp in length, 40 nM corresponds to approx 15 |g of dsRNA in 1 mL of medium. If 15 |g of dsRNA does not effectively reduce the target mRNA, consider increasing the amount to 30 | g, as this increased amount appears to have no side effects on control cells. 10. When Cnn levels were measured following RNAi, the protein fell to low levels by d 3 and 4 and then began to rise again by d 7 (see Fig. 2). In one experiment, Cnn was knocked down four consecutive times (not shown). Following the initial RNAi, the procedure was repeated three more times on the culture every 4 d. This experiment was possible in this case, because Cnn is not required for cell viability. One can also add dsRNA to the culture every day to achieve depletion of the target protein (43). Half-lives vary widely among proteins. Wei et al. (38) showed that one protein (HSF) with a known half-life of 8-10 h was reduced dramatically 2 d following treatment, whereas the more stable P-tubulin protein was relatively less diminished in the same time period upon RNAi targeting. Thus, for more stable proteins, it might be necessary to implement a second dose of RNAi on d 4. 11. Five hundred microliters of the cell pellet from the culture at d 0 gives ample protein for one or two gel loadings. S2 cells double approx once every 24 h, so on d 2, take 250 |L of the culture, on d 3 take 125 |L, and so on. It may be necessary to supply fresh medium to the cells on d 3, and this dilution should be accounted for when taking the next aliquot. 12. Precast gels are commercially available from Invitrogen, Bio-Rad, and others. Make sure the company's gels will fit your system. 13. Slides can be prepared in advance and stored dry for at least 2 wk. 14. For triple labeling cells in situ, like those in Figs. 3 and 4, we generally use a combination of secondary antibodies that include FITC, TRITC, and Cy5. For DNA staining we use TOTO-3. Texas Red emission overlaps too much with Cy5 and TOTO-3. For microtubule staining, Sigma sells a FITC-conjugated version of the DM1A monoclonal that gives a robust signal. 15. When the secondary antibodies are applied, other dyes can also be incubated in the same mixture (TOTO-3, Rhodamine-Phalloidin, etc.). Thus, a third incubation step is not required following the application of secondary antibodies. 16. Slides can be stored at -20°C for 2 wk, and possibly longer, with retention of the fluorescent signals. 17. Because the cells need to be imaged under an immersion lens, it is important that there is not too much solution under the cover slip. Otherwise, the surface tension from the immersion fluid will cause the cover slip to move in the Z direction, distorting the image. Alternatively, the cover slip can be anchored to the slide with clear nail polish applied to the edges of the cover slip.